We were surprised for one of our 8 grandchildren by her spiritual actuation of an advanced child as she celebrated her first year birthday January 10. Attended by her closed relatives and extended family, the birthday party though simple, but memorable ever. The party started with me giving the prayer and the blessing of the foods. 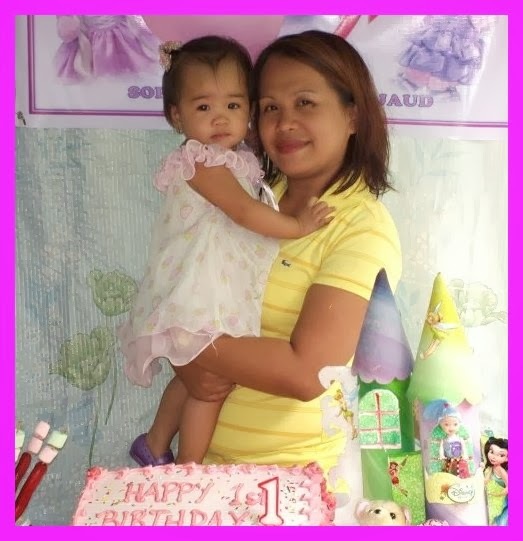 I invoked the presence of the Spirit of the Lord to be with us, to lead us to make this first birthday celebration of our granddaughter, Inday Sophie to be successful and full of fun and enthusiasm among the kids and even among the members of the family. I did ask the Lord to bless her of the wisdom of the Lord that she may grow up being obedient to the Lord's commandment as she does by being obedient to her parents, grandparents, and others whom she is subject to follow for the good of everybody. I did petition the Lord not to deprive her parents the blessing of work for them to be fully support her and also her other two siblings. Everything that has transpired that day I gratefully acknowledged them according to the Lord's will. The success of the party, the cooperation among the members of the family, our simple contribution either in money, moral support and even spiritual counsel were among those we were thankful. 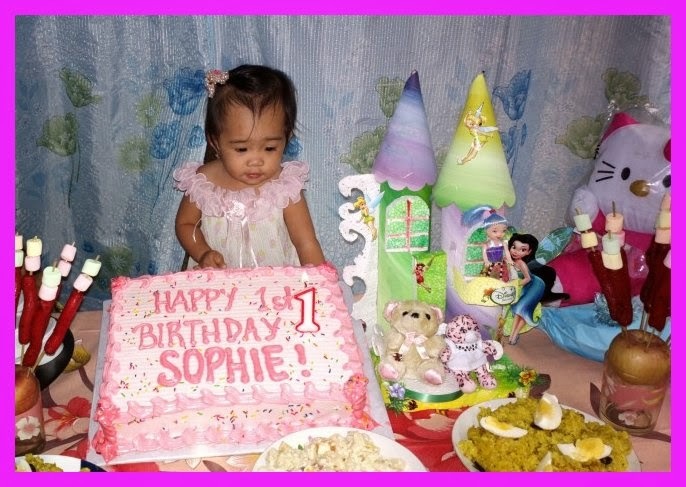 Everybody has the best birthday wish for Inday Sophie as she faces the world of challenges, the world of adventure as she grows according to the "nurture and admonition of the Lord." So be it. It started with Inday Sophie acting in her own unique way of praying before her sweet and delicious pink-icing medium sized cake. We were all surprised for such perfect prayerful manifestation of her. Then she blew the lighted number-one designed candle and clapped her hands in which we shouted for joy, for astonishment as we laughed loudly with gusto. Foods served were simple and economical like maja blanca, macaroni salad, valenciana, spaghetti, bihon guisada, hotdog in a stick with marshmallow, and orange juice. The kids enjoyed the "pabitin" game in which a hexagonal bamboo frame, adorned with cut-out pieces of crepe paper, wrapped with color red wax paper and attached with toys wrapped with plastic. As the pabitin being tied with a string and hanged at one of the sides of canopy and pulled up and down, the kids did their best to catch the hanging toys. Another fun was the kids were commanded to stand under the hanging rectangular box, decorated with pink crepe paper. Excited as they were, they waited for several minutes until the surprise fell down from the hanging box. A shower of flour got to their heads and a load of various kind, type of toys, candies, coins, among others came out. They enjoyed grabbing on the floor. Those who were alert and fast got the most number of gifts. Gift-giving concluded the one-hour birthday party. Inday Sophie carried by her mother on her arms enjoyed seeing the kids receiving their plastic pack of assorted gifts from Sophie's mother. As the kids fell in line, they were wearing party cartoon hat. Inday Sophie's gifts were opened by her mother. 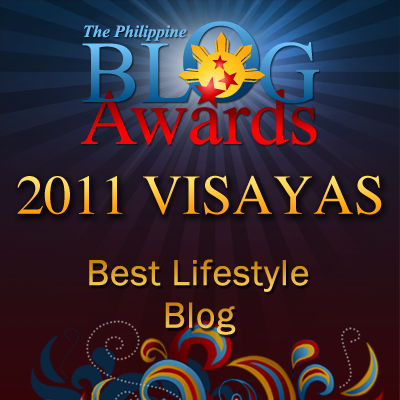 Those gifts came from her thoughtful Tita Carissa and from her sisters, Bulaklak and panyang. Papa Tipoy, Mama An An, Lola Rebing, Tita Gigi, Tita Carissa, Manong Bryan, Manang Bulaklak, Manang Panie and Tatay Gilbor, and special mentioned Tita Gingging were the persons who did their best to make this party a success. And of course, all these things we give back the honor to the Lord for his kindness, generosity of blessing us to be well, to be active in serving Him as we do our best in our own capacity to provide the needs of our family. Thank you Lord. 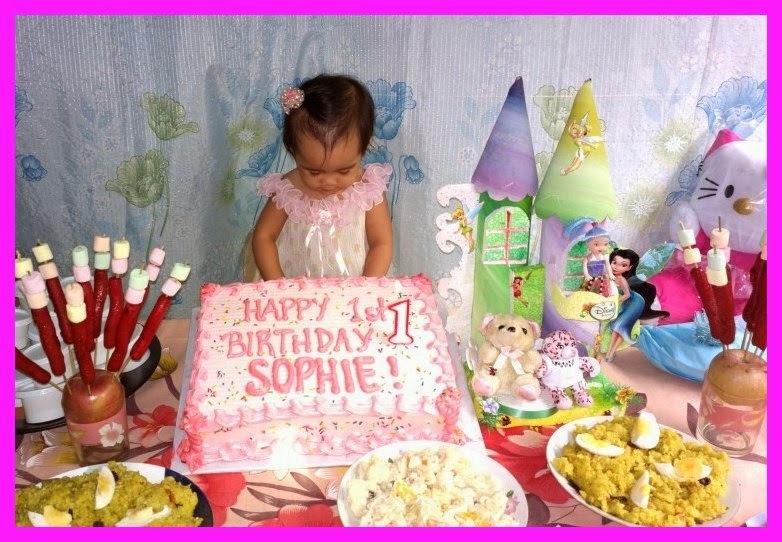 Happy Birthday Inday Sophie. Happy birthday to baby Sophie. :) There must be a lot of great pictures taken and these will make her remember good memories when she grows older. Happy 1st Birthday Sophie! May the good Lord bless you always. Sophie seem excited for her first birthday. Happy Birthday to her. It is obvious that Sophie is getting the right guidance from people around her. She looks very intent in praying. 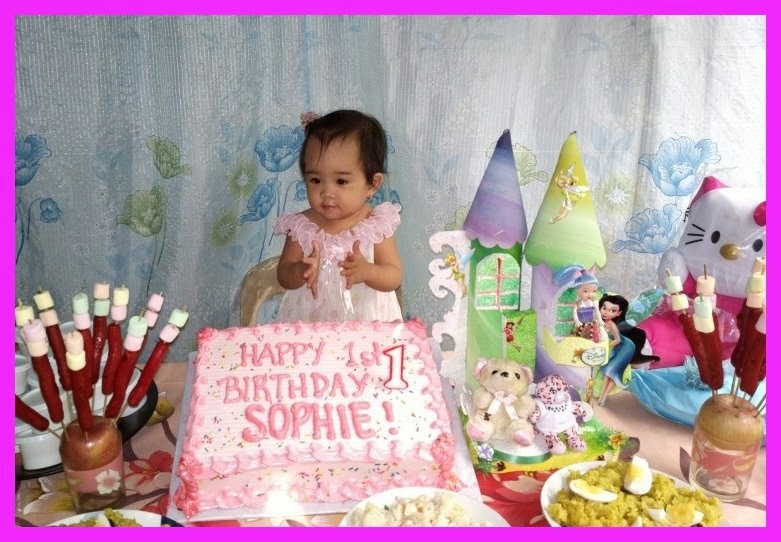 Aww.. belated Happy Birthday to Sophie! I bet she had so much fun! One of the most special 'firsts' for Sophie. Wishing for her the best. happy birthday Sophie!!!! May you grow up to be healthy and happy!! What a lovely birthday for her...happy birthday too! the cake looks so huge with her standing infront of it! love its colour! reminds me of my daughter's 1st bday too! What a wonderful lifestyle of this cute little girl. A lifestyle that is full of spiritual wishes and blessings for Sophie. Happy birthday to Sophie! May she be the best person she could ever be with the guidance of our Lord Almighty. First birthdays is really a milestone for a baby and glad her party went well. What a cutie!!! And a lucky and blessed baby! :) God bless always! I am totally in love with Sophie luscious First Birthday Party Ever. The little angel is looking super cute in these photos. Even I also planned a polka dot themed party for my princess’s birthday and trying to get some nice inspirations for the party venue décor. Do you have any ideas for our theme?